A small pencil or dotting tool, two brown colors a light one and a darker and white, black and red nail polish. How to make this cute Rudolf? This ‘nail art’ is perfect for nail polish but also for gel nails! It’s an easy way to give your nails something shinny! Paint your nails in the color you want. When this is dry you paint your ring finger with the glitter top coat. For the rest you use the sponge. So you lay a thin layer glitter top coat onto the sponge and dab this onto the top of your nail. How to make this snowflake nail art? Start with the blue base color and let this dry. Than start with your snowflake by painting three stripes as small or big as you want! Add a few spiky details on each stripe to create a snowflake. These were my three easy Christmas proof nail arts! I hope you loved this article! And don’t forgot to seal you creation with a top coat! Wat leuk! 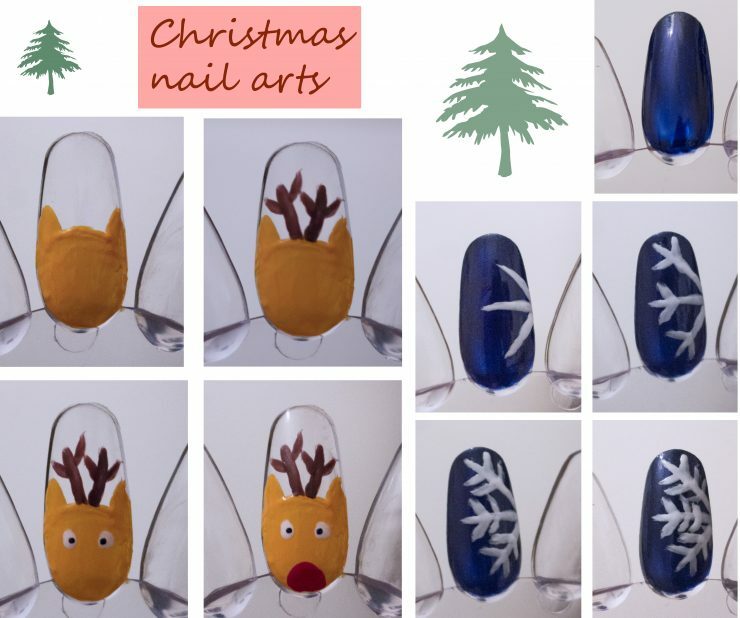 Vooral de Rudolf Nail Art! Super leuk! Ik wil ook zo graag een keer iets doen met nailart, maar het mislukt altijd bij mij. en mijn nagels zien er momenteel niet uit… Rudolf vind ik super cute!